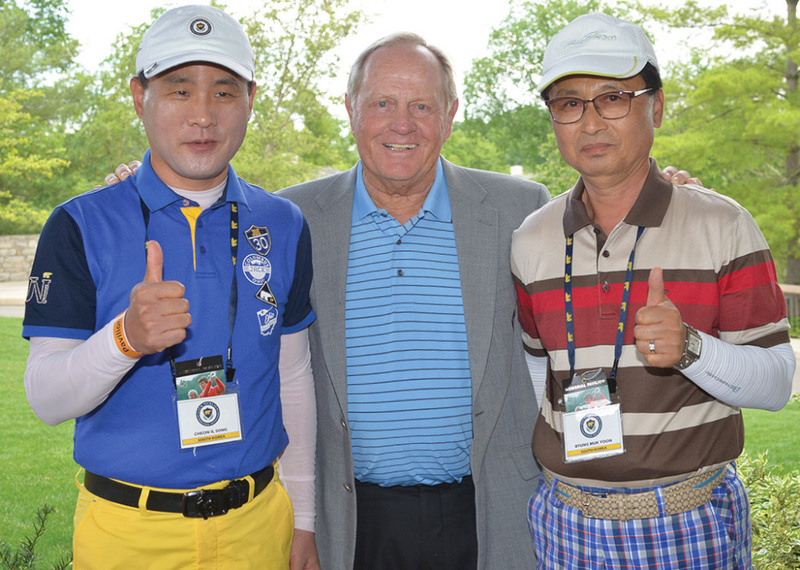 Jack Nicklaus with the champions of the Jack Nicklaus International Invitational Tournament of Champion, Cheon Im Song and Byung Muk Yoon of South Korea. The 9th Jack Nicklaus International Invitational (JNII) concluded with its international final on June 3, 2015. The tournament’s ultimate event was played at Scioto Country Club in Columbus, Ohio, where a young Jack Nicklaus first learned the game. Known as the Tournament of Champions, the international finals of the JNII bring together the winners of all JNII national tournaments held over the previous 12 months in various countries around the world. This year, teams from five countries advanced to play for their country in the 18-hole international final sponsored by Jack Nicklaus Apparel. Cheon Im Song and Byung Muk Yoon from South Korea won the competition with a net score of 70. The South Korean duo played the back nine at 3-under par to surpass the Filipino team of Ivan Ferreras and Sammy Sy who finished with a net 71. Indonesia’s Andrey Atmadji and Sugianto tied Andrew Morgan and Santosh Maharaj of South Africa for third place. The JNII is a two-person team competition for recreational players of all skill levels who get to experience competitive golf in a relaxed, social atmosphere that promotes camaraderie and interest in the game. Players who enter national JNII events get to play top courses in tournament-like conditions and have a chance to win great prizes, including an expense-paid VIP trip to play for their country in the Tournament of Champions. This year’s festivities at the Tournament of Champions began with the Champions Dinner at the Jack Nicklaus Museum on the campus of The Ohio State University, where the players were awarded the Golden Bear Champions Blazer for winning their national championship. It was followed with golf at Scioto Country Club, host of the 2016 U.S. Senior Open, and a VIP experience at the Memorial Tournament presented by Nationwide including a meet-and-greet with tournament host and founder Jack Nicklaus. “This was awesome…I don’t want it to end. I mean, I want to go home to my family, but I don’t want this to end,” said Andrew Morgan, representing South Africa in the competition. National tournaments for the 9th Jack Nicklaus International Invitational begin in select countries around the world in late 2015. The international final Tournament of Champions is scheduled for the week of May 30–June 2, 2016. JNII events are open to recreational golfers of all skill levels. For additional information, visit www.jniigolf.com and follow the action on social media (facebook.com/JNIIGolf and Twitter (@jniigolf).